Dad of Divas' Reviews: K'NEX Mario and the Golden Ticket Contest -- Win a Wii! 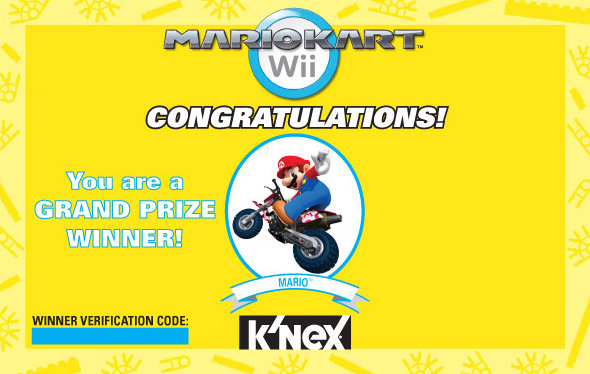 K'NEX Mario and the Golden Ticket Contest -- Win a Wii! Receive Mario with the Golden Ticket and Win a Wii! From Monday, June 13, through Friday, July 15, 2011, K’NEX Mario Kart Wii fans can register online to receive a free Mario™ or Luigi™ K’NEX figure. 300 figures will be distributed for each day of the five week promotion. Of the 10,000 figures, five lucky grand prize winners will receive a Mario figure plus a Golden Ticket that entitles them to a special prize package including: a Wii™ console (a $150+ value), the entire K’NEX Mario Kart Wii product line (18 toys featuring Mario, Luigi, Yoshi™, and their favorite karts and bikes on two popular Mario Kart Wii tracks -- a $632 value) and a trip to tour K’NEX headquarters in Hatfield, PA. For more information, complete rules and to enter the sweepstakes visit www.knex.com/mariogoldenticket. No purchase necessary.